Today I was out for a mountain bike ride in an area that many people hike and bike on. There was a new sign at the start of the trailhead. ‘Private Property’ – Island Timberlands. Right next to it was a sign about some ‘partnership’ to protect sensitive areas signed off by Nanaimo, the BC Government and Island Timberlands. This got me thinking, did anyone think about protecting the area BEFORE Island Timberlands clearcut the entire area? Of course they are OK with protecting the area right now because it is going to take 25 to 30 years before the trees are big enough to cut down again. Why doesn’t anyone see this? The logging company has done MASSIVE environmental damage to vast areas and NOW they are working with the government and city to protect it from hikers, mountain bikers, horses, and motorbikes? The damage is done. What’s with the signs threatening fines for unauthorized vehicles without mentioning what kind of vehicles are unauthorized? Don’t get me wrong, I am fine with logging as an industry. If it is sustainable and not blatant clear-cuts, you won’t hear me complain(much). Trees are a renewable resource. 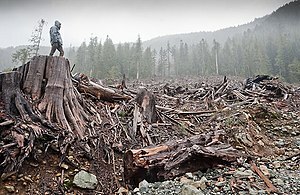 If we didn’t just give them away as raw logs to other countries, I think most Canadians would be fine with logging too. But don’t pillage the land, then threaten up to $50,000 fines for people that are just enjoying a single trail that has been there for decades. Previous PostPrevious What are your thoughts on Nuclear Energy? Next PostNext When you can’t decide what you like, choose Linux!